If you watched last night’s DC’s Legends of Tomorrow, you probably already know the news. Deadline reports castmember Wentworth Miller is leaving the CW series as a regular. 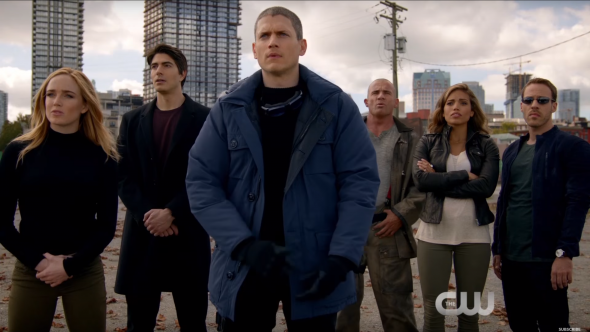 On the freshman superhero drama, Miller played Leonard Snart aka Captain Cold, a petty criminal who can freeze objects and people with his cryonic gun. [SPOILER ALERT] During the penultimate episode of season one, Miller’s character sacrificed himself for the good of the Legends team. The move was apparently part of a season-long arc for Snart, as Miller had signed a short-term deal for the series’ first season. It’s not all bad news though. Miller has signed on as a series regular for Warner Bros. TV, which produces The CW’s other DC series The Flash. So who knows? Perhaps Snart will show up somewhere else in the DC universe. Maybe Supergirl, which will move to The CW for its second season. The season one finale of DC’s Legends of Tomorrow airs on May 19th. What do you think? Do you watch DC’s Legends of Tomorrow? Are you a fan of Wentworth Miller? Am a fan of Wentworth after The Flash and Legends. I love Leonard, and am really sad to see him go. Maybe he could be brought back to life? Yvonne said it so well. Please bring Wentworth’s Snart back to Legends as a regular. I’m heartbroken that Wentworth Miller is leaving the show!! Perhaps he is doomed to be seen only in the past in Legends?. But if Kendra and Carter can reappear, why not Snart? Please reconsider. Wentworth’s Snart deserves to be a regular cast member to Legends. Really liked Wentworth Miller’s character. They should have Mickelson get into trouble somewhere and be saved by his buddy who was somehow reconstituted from his own atoms, a distillation process of the Oculis not known before. I have always liked almost all of the CW shows for years now, just my kind of TV. I cried when he died, too. Deeply disappointed to lose Captain Cold. He was one of the best things on the show. I liked him. I was disappointed when he got killed. I will miss him and hope he shows up again in one of the others. I love Wentworth Miller, and his acting style. I hate to see him leave Legends. I watched all his Prison break episodes and look forward to the return of that show, and the actor, to any DC shows. Go Wentworth!